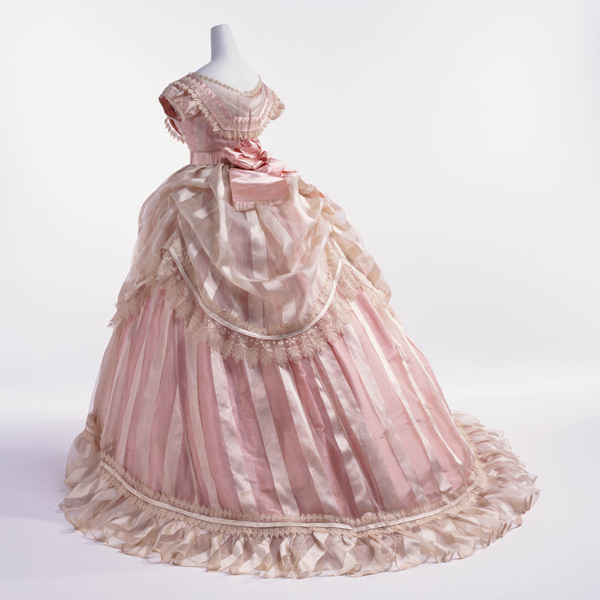 Bodice of sheer ivory striped silk with pink silk taffeta; triple-layered skirt (sheer ivory striped silk skirt and overskirt, and pink silk taffeta underskirt); worn over large crinoline. 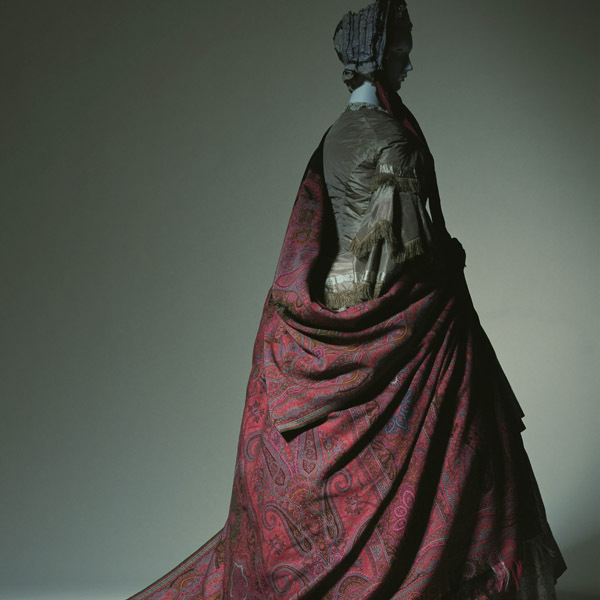 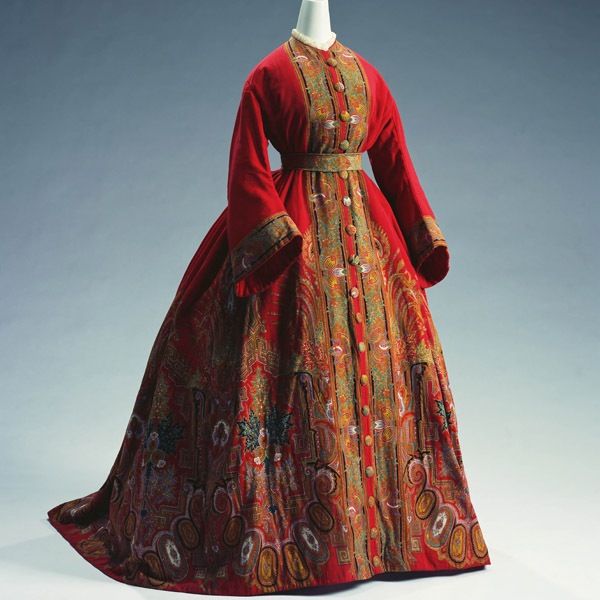 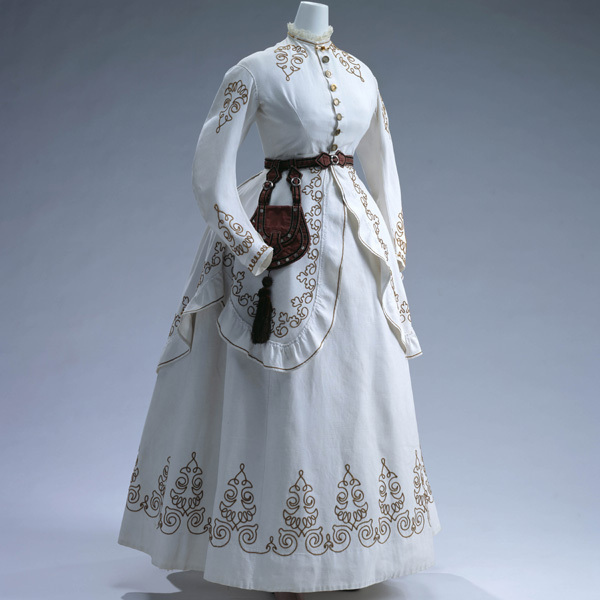 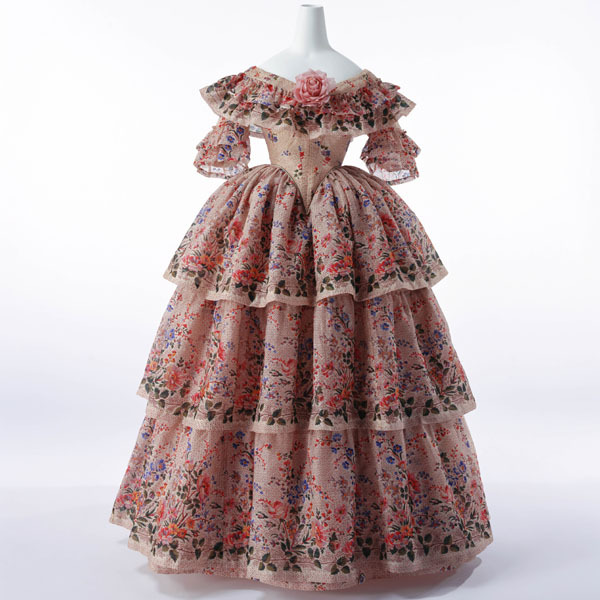 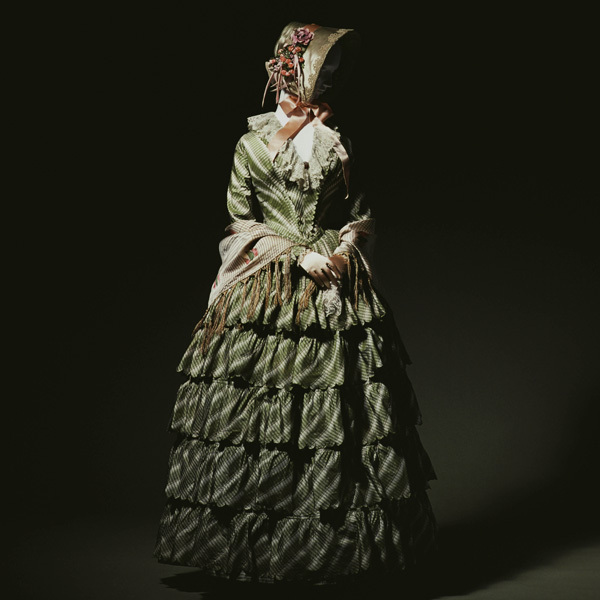 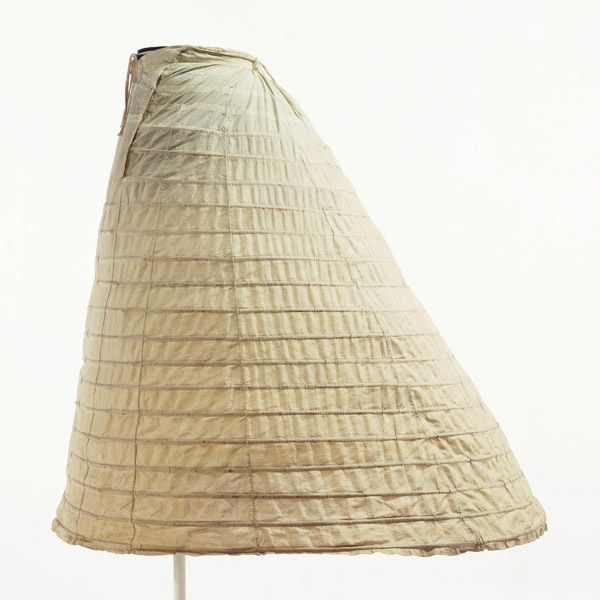 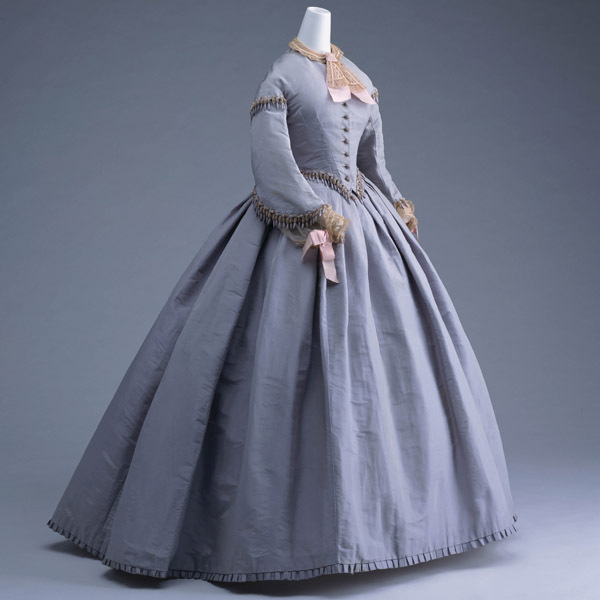 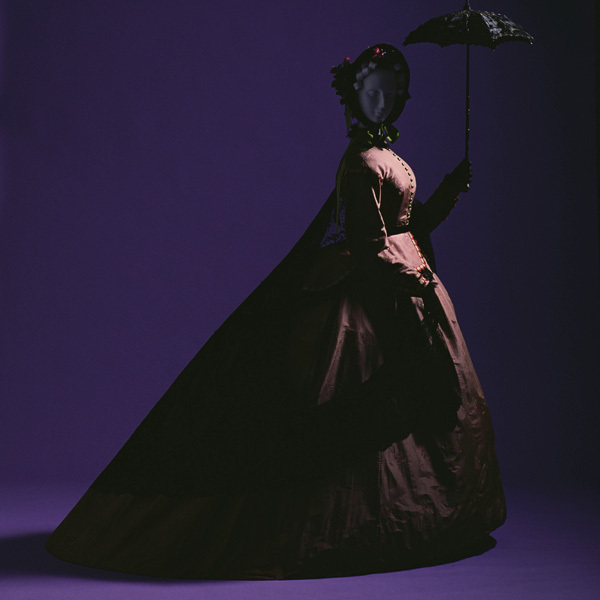 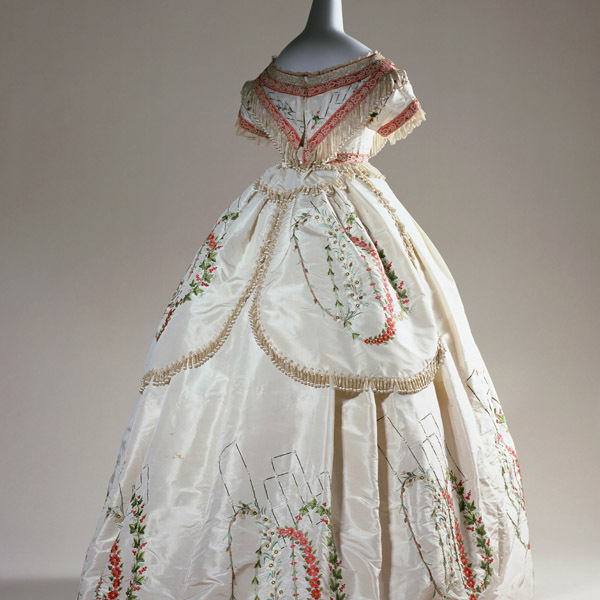 This is a typical example of a dress in the crinoline silhouette with its volume concentrated on the back side, like it was popular in the mid-1860s. 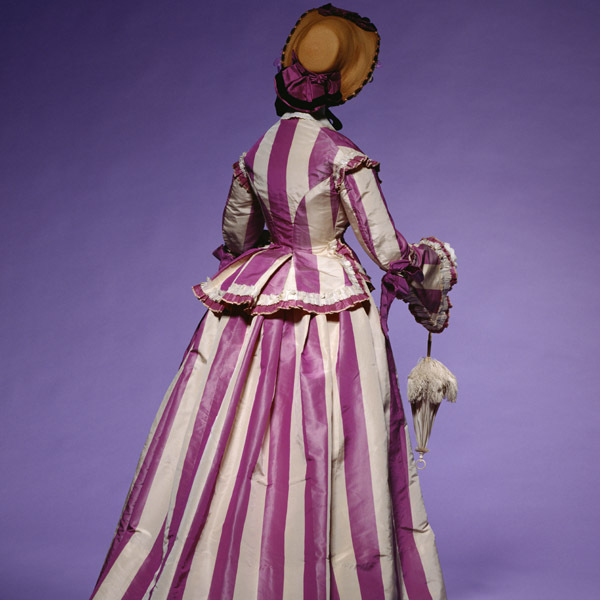 The apron-shaped overskirt equally accentuates the back side. 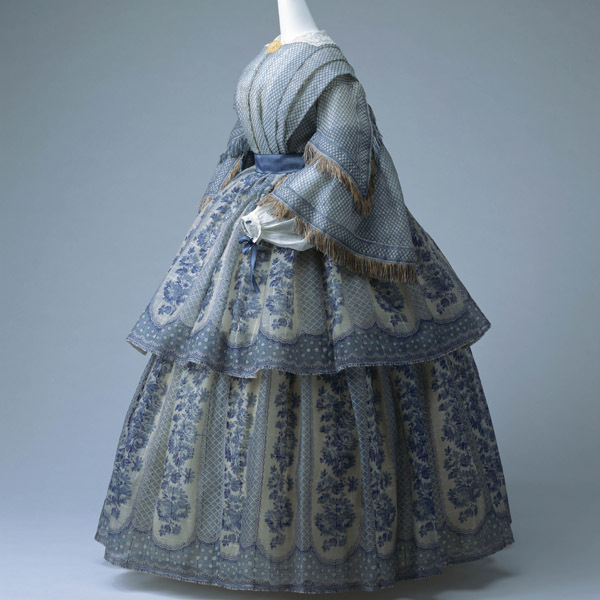 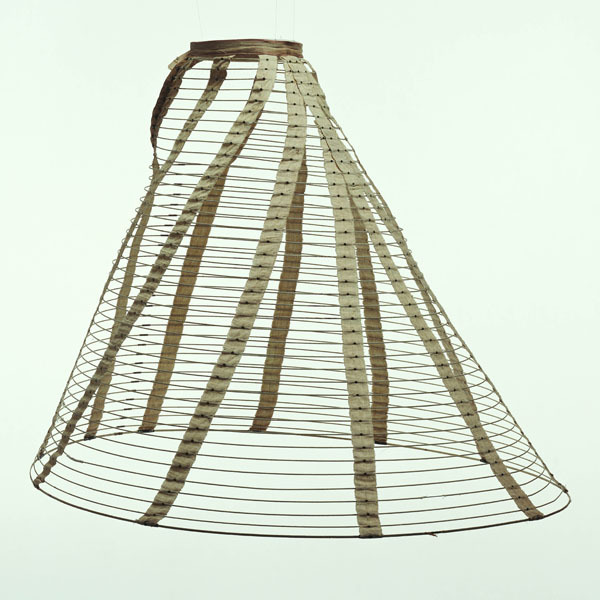 While the diameter of the skirt measures approximately 150cm from front to behind, the overall circumference spans around 470cm. 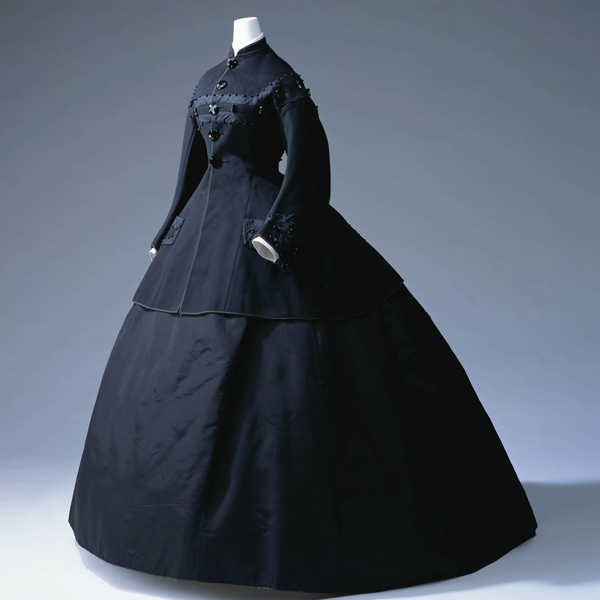 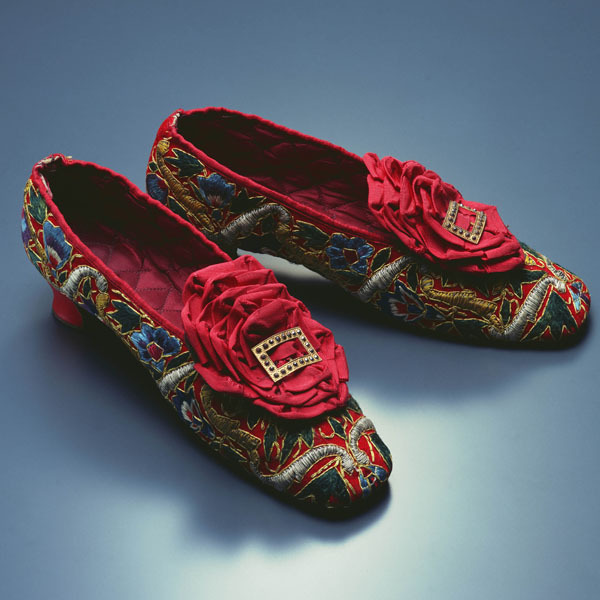 In France, during the Second Empire (1852-1870) under the authoritarian rule of Napoleon III (1808-1873) and the impact of economic growth caused by modernization, the luxury goods industry, including fashion, greatly progressed. 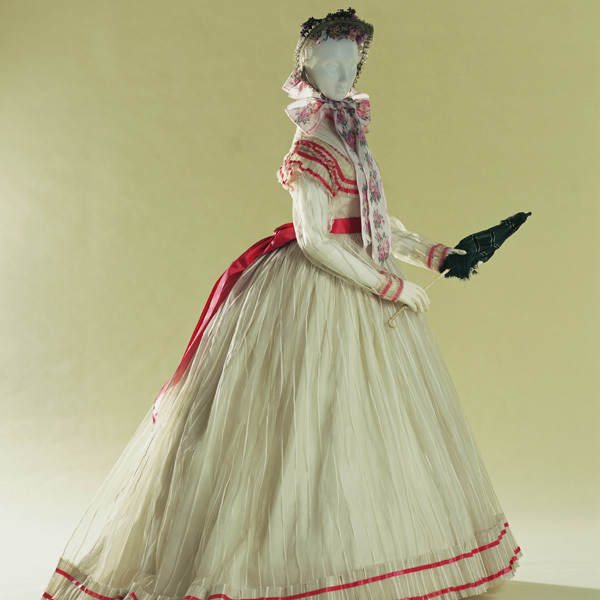 There are plenty of examples for this tendency, for instance the application of delicate lace or elaborate trimming decorations on crinoline dresses, with the crinoline style already in itself demanding abundant usage of cloth. 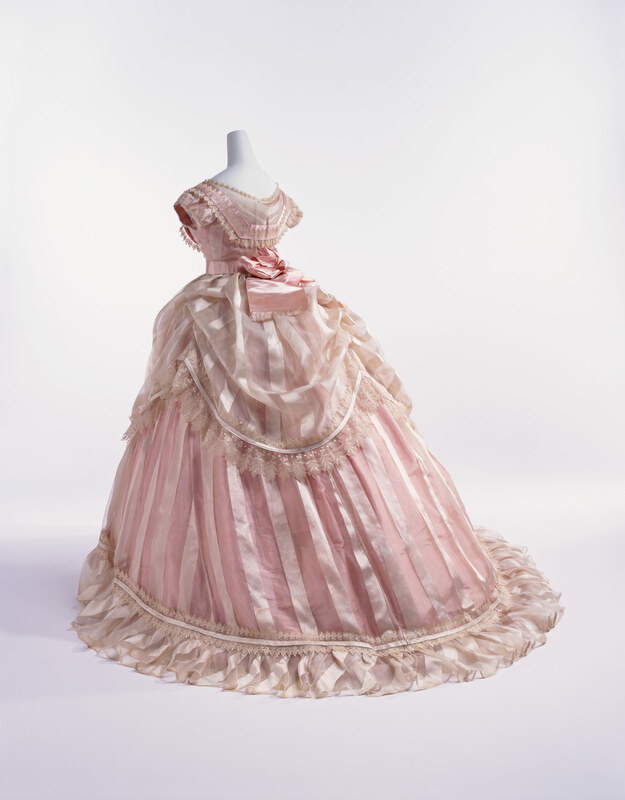 On the frequently held formal ceremonies, balls or large-scale events like the International Expositions, women of the wealthy classes competed with each other for the most sumptuous dresses as well as the numbers of them they owned.